I designed the Bandit for me!!!! (but I am willing to share) The Bandit is a symmetrical airfoil version of the Titan. The long narrow wing of the Titan has always been one of my favorites and I wanted a "go fast" and aerobatic version. It has a unique and beautiful shape that stands out in the sky. The roll rate is incredible and very axle. With the recommended motor/prop combo the Bandit has a of speed range of 20 to 85 mph on a 11.1 volt 3S battery. It is truly a gorgeous wing and flies as good as it looks. The 57" Bandit is for those flyers who want a faster and more aerobatic long wing. This plane is a lot of fun to fly. It is built to take abuse and survive. The symmetrical airfoil helps this plane fly the same upside down as it flies right side up. Inside and outside loops are easy and predictable. The Bandit can be fast but remains very controllable with an easy flair on landing. The symmetrical wing on the Bandit is the same thickness as the semi symmetrical wing on the Titan. It is easy to balance on the CG with one 2700 3S battery which makes it inexpensive to set up and fly and helps to keep the weight down. It is thick enough to put your battery on its side with the side facing forward to protect the battery in an accident. Planes with lighter weight have a better glide and improved slow speed performance and longer flight times. Let me compare the Bandit and the Titan. They are the same thickness at the thickest point. Both fly well and are great aerobatic and indestructible designs. They are both built using the same building instructions. The Titan is designed for higher lift and slower glide. It is still very aerobatic and one of my personal favorite combat planes. The Bandit is designed for enhanced aerobatics, precision and high speed flying but because of the clean symmetrical airfoil it has the increased ability to fly inverted with almost no down stick and to maintain stability at ballistic speeds. The Bandit airfoil will fly great with the same motors, props, batteries and ESCs as the Titan. 1. Reflex is almost not needed on the Bandit because of the symmetrical airfoil shape. 2. Bend the motor mount so the motor is set at 0 degrees to the thrust line of the wing. 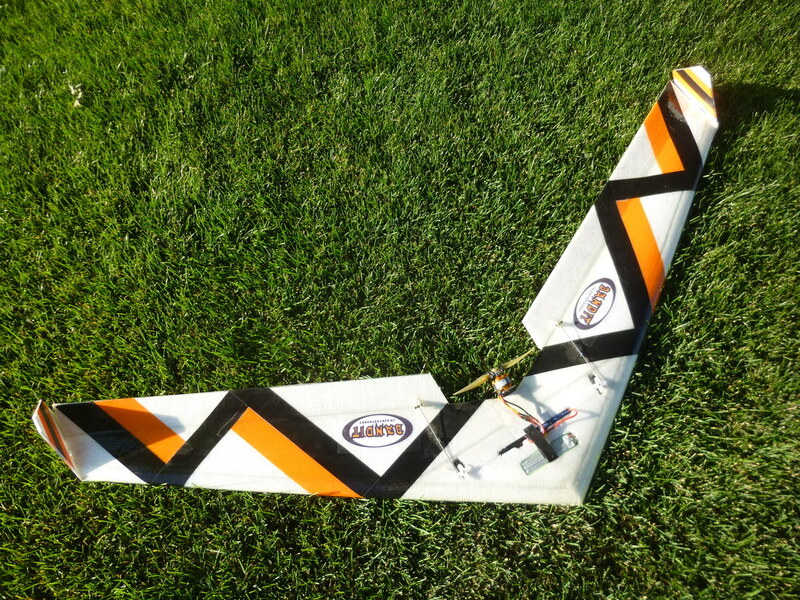 The 57" symmetrical wing Bandit kit includes the laminate and motor mount making it one of the best deals for this size plane on the market and is also available with our buy 5 get one free discount. It is hard to beat Crashtesthobby's prices, durability and customer service. We design our planes to be more durable and easier to maintain. We have designed the Bandit to fly with a 2200-3000 mA 3S battery without added nose weight if you build light. (Many planes on the market have to have the builder to cut into the back of the wing, add a lot of weight like batteries to the nose of the plane, or to put a fuselage on the plane to get the CG far enough forward to get the plane to fly.) The lighter weight of the Crashtesthobby designs have many advantages in flight performace, lower costs and durability. With the recommended motor/prop combo the Bandit, Titan, Grim Reaper and the Bullseye have a of speed range of 15 to 85+ mph on a 3S battery. They are truly a versatile wings. To get more speed increase to 4S or 6S on the cells on the battery and make appropriate adjustments to which motor, prop, ESC and servos you are using. Please log in and join the discussion at: RCGroups ... "Reaper, Titan, Gladiator, Thread"